Cherry Mobile Flash With LTE And Fingerprint Scanner Goes Official, Priced At 5999 Pesos Only! Home / cherry mobile / mobile / news / Cherry Mobile Flash With LTE And Fingerprint Scanner Goes Official, Priced At 5999 Pesos Only! Surprise, Cherry Mobile just announced their latest interesting handset. Dubbed as the Cherry Mobile Flash, it's a stylish and premium looking smartphone that touts midrange specs and modern features with a low price tag. The Cherry Mobile Flash surprisingly used good type of 5.5 inch panel that uses a full HD resolution of 1920 x 1080 pixels at 401 ppi. Under the hood it far from shabby as well, it uses the reliable 64 Bit 1.3 GHz MT6753 octa core processor from MediaTek paired with Mali T720 GPU that's good enough for light to moderate 3D gaming. The Flash is also equipped with ample 2 GB of RAM, 16 GB of expandable internal storage up to 32 GB, 2,800 mAh of battery capacity. There's also a 16 MP main camera at the back and an 8 MP selfie sensor in front. It also has WiFi, Bluetooth 4.0 connectivity, and fingerprint scanner. 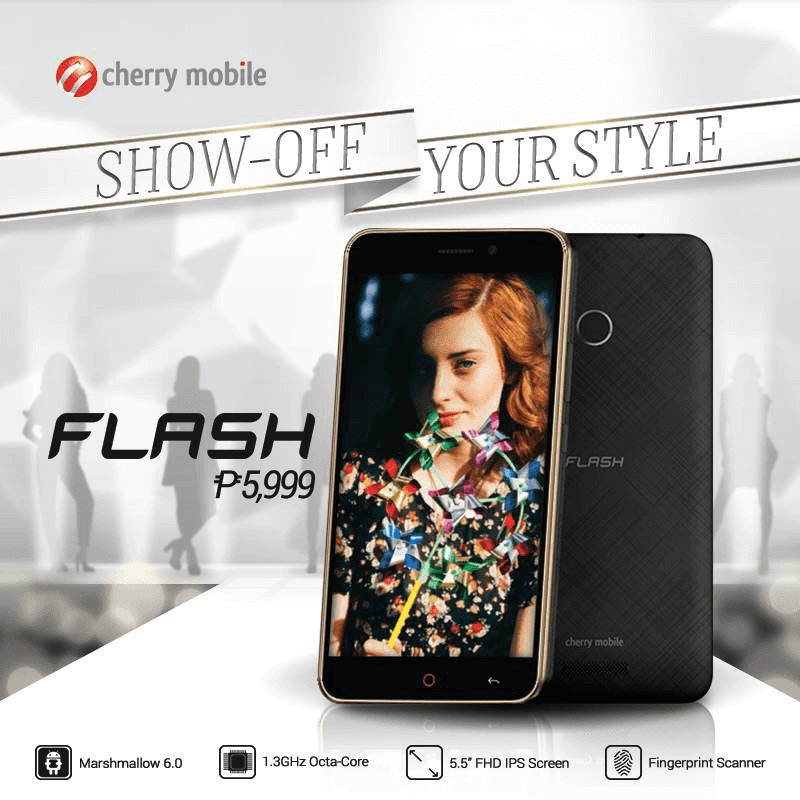 The Flash is now available in Cherry Mobile stores with an SRP of just 5,999 Pesos. It's a steal on paper.